This partnership was started in 2008 and aims to protect some of our most precious taonga in one of the most stunning and least-visited areas of the North Island. Blue Duck (Whio), North Island Brown Kiwi, and old growth forest will be protected by the combined pest control efforts of DOC, Horizons, landowners and iwi. Children from Orautoha School, Te Kura Kaupapa o Ngati Rangi and local land owners released 12 whio onto the Manganui o te Ao River at Ruatiti Domain in late March. About 40 people gathered to watch them being set free. The birds were raised in captivity at Pukaha Mount Bruce National Wildlife Centre, Orana Wildlife Park and Peacock Springs Wildlife Park from eggs taken locally. Between July 2013 and February 2014 DOC and Horizon Regional Council trappers have serviced 1436 traps. In addition, there are some extra traps in the Manganui o te Ao River, which were set up last year to try to widen the trap network. These were DOC 250 traps, used to target ferrets - they have not made any kills so far. DOC staff conducted six surveys for whio in the core ‘Security Site’ rivers between August and February. On the Manganui o te Ao River 22 pairs and seven single birds were recorded and 15 pairs and ten single birds were recorded on the Retaruke River. The large floods in October and smaller floods throughout late spring have meant that sadly, no ducklings have fledged in the core river stretches that we monitor. It is possible that some pairs may have retreated up side streams to try for a second brood. Up to seven ducklings were reported early in the season in the wider trapped area; however it is likely these birds did not survive flood waters as they were too young to survive. Review trap locations to see if improvements can be made. Strategic thinking about trap locations and efficiency in the Retaruke has led to the removal of some peripheral trap lines. These are at locations which we do not believe are critical to protect whio in the ‘national Whio Security Site’. We understand that these traps are on private land and may benefit other wildlife or whio outside the Security Site. If landowners wish to contact us regarding the continuation of their private trapping system DOC and Horizons are happy to discuss this and look for ways to support it. Horizons are currently exploring the option of using bait stations on private land to help control predators. This is a trial scenario and will be evaluated for success at the completion of the trial period. We may decide to intensify trapping instead. Local's who travel along the Whanganui Awa have told the Department of Conservation that they have noticed a huge increase in bird life and bird song over the last 5-6 years. This is fantastic news and is anecdotal evidence for the continued improvements in the health of the ecosystem. We have demonstrated that we are getting a good knock down of rats and a great suppression of mustelids through the Kia Wharite project. The birds should be getting at least 1 season of increased breeding success and maybe 2 out of every 3 years with the current 1080 cycle. Possum trapping increases during winter and with the season fast approaching it is timely to remind people that possum traps can endanger kiwi if they are not used correctly. Our area has a prevalence of kiwi and we need to keep them safe. These images below are of a local female kiwi bird that was caught in a ‘leg hold’ trap set on the ground and had to be euthanized. She had been a very healthy specimen. These types of injuries happen strictly when ‘leg hold’ traps are set on the ground. Most leg injuries will mean that the kiwi will have to be euthanized. You can help protect kiwi in our region by raising the trap off the ground by 35cm. This will prevent kiwi from walking over a trap and being caught. This will not impact on the efficiency of the trap as possums will still reach up and get caught in the trap. To raise the trap you can either use two nails to attach trap to a tree or use wooden boards to sit the trap on top of. In other regions where weka are present we advice raising traps to 70cm. Some traps (including the commonly known ‘gin traps) are illegal following amendments to the Animal Welfare Act (1999). It is also an offence under the Act to set traps within 150 metres of any dwelling or to leave traps uninspected for more than 12 hours after sunrise on each day the trap remains set. Lanes Ace (commonly known as Gin trap). Double-coil spring size 11\2 unpadded. To protect kiwi from injury please ensure that you take these simple steps. For more information please contact your local Department of Conservation office. The project partners have worked with Whanganui Iwi, the Ministry of Social Development and Te Puni Kokiri to develop capacity in local communities to carry out conservation work. 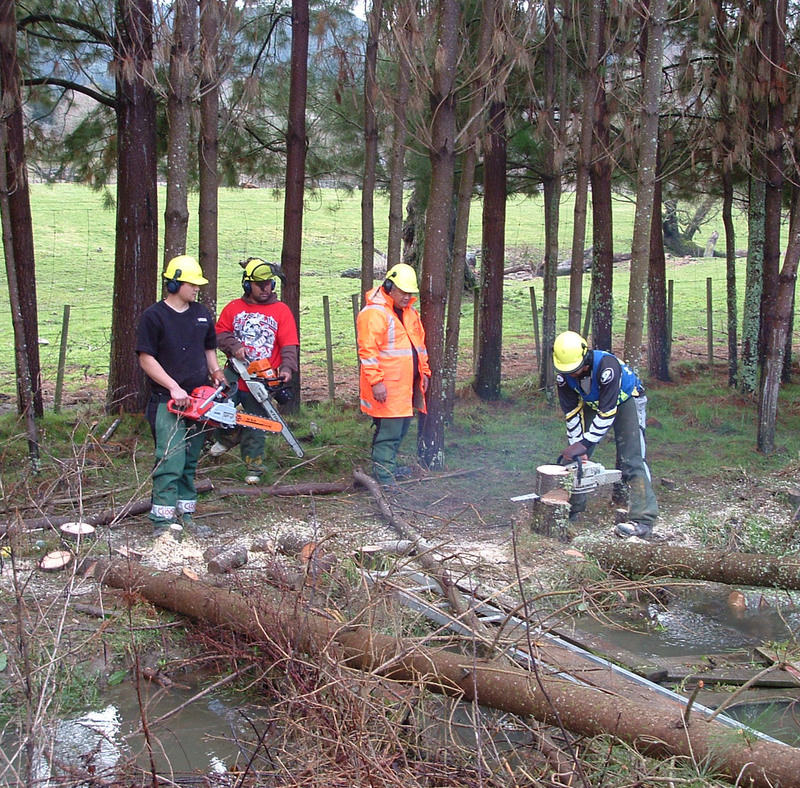 Under the banner of Te Amo Taiao, the Hinengakau Development Trust (an iwi based organisation) has employed four trainee staff and a supervisor to learn conservation related skills. The team has developed into a highly competent group now carrying out conservation related contract work for Kia Wharite. Te Amo Taiao cadets learning chainsaw skills. Kia Wharite won the Working Together for Better Services category at the IPANZ awards on Friday 18 June. The Excellence in Working Together for Better Services Award recognises outstanding performance and achievement of joint outcomes across public sector agencies and identifies projects which will enhance government’s engagement with communities. The Kia Wharite project integrates management of 180,000ha of the Whanganui Catchment to improve land, water and biodiversity health, and enhance community and economic well-being. It is the largest project of its kind in New Zealand in terms of scale and scope and has already achieved national species protection targets. 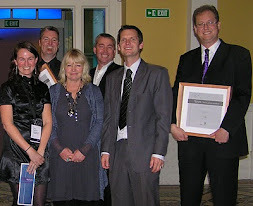 DOC and Horizon staff with the award. Kaitieke School in the Kaitieke Valley and Orautoha School in the Ruatiti Valley are the main schools within the project area and are regularly involved in the project. Orautoha School monitor their own stoat trap lines with the help of local whio Rangers. They are also working with Horizons Regional Council building their own wetland which will benefit all of the native species near the school including the whio that live nearby. Kaitieke school are actively involved in data analysis and raising public awareness for Kia Wharite. In 2008 they made their own environmental film titled ‘Protecting our native Blue Duck’ and planted 200 native trees as a first step to restoring the back paddock to native bush and to increase native birdlife and protect the Kaitieke stream. In term two of this year the children studied a number of animal pest species and the impact they have on our native species, and this inquiry concluded with the children placing four DOC200 traps in the school native area, which they now monitor. Each school keeps a pest tally out the front of the school to enable the locals to get an idea of how many pests are being caught locally.